In defending his vote to dismantle Net Neuratlity rules, FCC Chairman Ajit Pai insisted that not much would change for consumers; ISPs would voluntarily refrain from degrading internet service. Michael Powell, president of the telecom lobbyist N.C.T.A., wrote that the good ol' invisible hand of the free market would ensure that the principles of net neutrality would still be adhered to: "Degrading the internet, blocking speech and trampling what consumers now have come to expect would not be profitable, and the public backlash would be unbearable. Economic self-interest and the pursuit of profits tilts decidedly toward an open internet." Never mind that ISPs often act as local monopolies, immune to competition, and have already been convicted of breaching Net Neutrality on a huge scale, multiple times, affecting 100 million Americans while it was illegal to do so. Of course, ISPs have actually been planning to toss Net Neutrality principles out the window once the rules were revoked, for months. On April 26, Ajit Pai announced a vote the start the process of eliminating Net Neutrality rules. 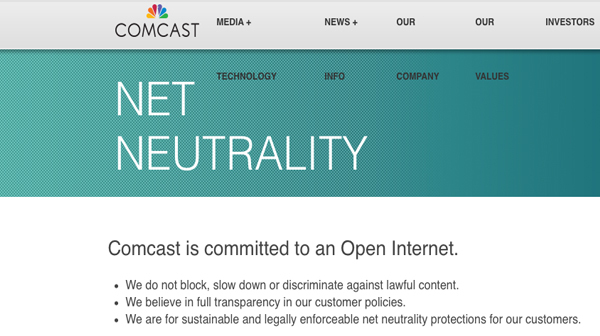 On April 27, Comcast somehow had a change of heart regarding its fidelity to Net Neutrality principles, and its website's commitments were suddenly missing a few key promises (see the date in the upper right corner). Those promises are still absent from its website today. Where is the invisible hand of the free market, preventing Comcast from staying faithful to net neutrality? Nowhere to be seen.